This is Northstar, Lake Tahoe's most elegant resort. Northstar is to Tahoe what Beaver Creek is to Vail! The resort is composed of lodging, a village, a ski resort and golf course. And just outside of the Northstar gates is the cutest little town called Truckee. When you go through the gates of Northstar just off Highway 267, you will find that you have been transported to a place like you've never seen. Northstar has been built with comfort in mind and it truly is a "resort" with everything all encompassing once you past their impressive gates. As you head up toward the slopes and their Village, you will pass all the vacation lodging. Their village, which is hard to stop saying "new" is constantly changing with an array of high end stores and you can shop till you drop! Designer name clothing, sporting goods and specialty stores so you can always find great items for your trip, or to bring back home a few souvenirs. Unlike most of the ski resorts in Tahoe, Squaw and Heavenly in particular, Northstar is more "all inclusive" once you are there, you won't really want to leave as everything is there for you. The restaurants in The Village are all originals and are varied and delicious. I tend to favor sushi so that is always my first stop. The chocolate shop was also very delicious... and not what you think. It is not a "chocolate restaurant" but rather gourmet delicacies. Funny name, and I never asked why, but none the less, it is right at the base of the chair lifts, so you got to stop and have a cocktail. The resort is very complete, you can even order your rental skis and have them delivered to your door,. Since this is a popular service, be sure to order ahead to make sure your size is put aside. There are several different levels of accommodations and kinds of lodging available for your vacation. You will find a few exquisite homes, mostly rental townhouses, and the hotel style condos in the village. If the properties are located inside the Northstar gates chances are they will have use of the recreation club which has a swimming pool, spas, tennis courts and all the amenities you would expect. Outside of the resort, in the surrounding neighborhoods, there are also more traditional homes which are very quiet and tucked into the forest. The private residences all offer full kitchens which is perfect for breakfast and family dinners. You'll get fireplaces, hot tub / spas and all the popular amenities. In the village, there are condo/hotel rooms that are above all the shops and restaurants. Well appointed and very posh, these luxury accommodations are top quality, with a front desk, gorgeous rooms and definitely 5 star. Different areas are more popular than others, but the key is to be on the free shuttle route so it doesn't matter where you stay exactly, as long as you can get around without your car. 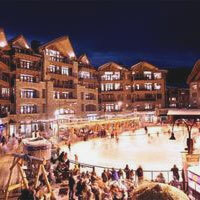 The Northstar lodging offers a wide price range so there is something for everyone. There are also a few hotels just outside of the main gates, such as the Northstar Ritz Carlton which offer another kind of experience for a different kind of guest. For the skiers and snowboarders, the Northstar California Resort is fantastic. There is a lot of terrain so you will need multiple days to do it all. When I skied it just last year, I was amazed at how many runs they've added from years past. I was expecting all groomers and cruisers, but found enough to make my legs burn. From the bunny slopes to advanced full of moguls, you'll have enough!. You'll want to get your Northstar lift tickets ahead of time as well to take advantage of our discounts. Just outside Northstar is the cutest little western town called Truckee. Funny name, it still has it's train station and the main drag is loaded with shops all done up to reflect its western heritage. Yes, that means the building still look the way they did when Truckee was a bustling mining town as was all the resort areas in Tahoe. It's where the name "golden region" or "golden sierra" comes from which is what is referred to as the resort areas. You have to take a drive and see for yourself when modern meets old in a whimsical way. And certainly save a night for a restaurant or two... western style. You'll be quite surprised how delicious the fusion of western and California style cuisine can taste.